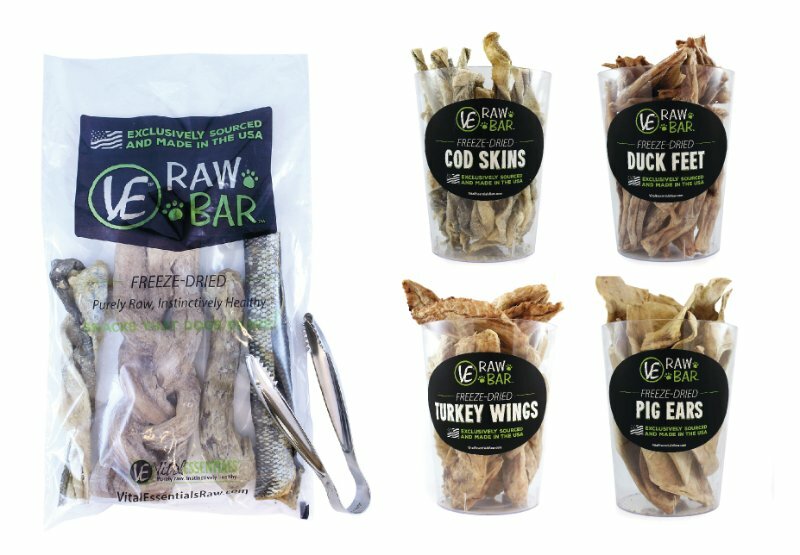 Vital Essentials Raw Bar, introduced in Summer 2016, has been a success for our retailers. Many of our retailer partners were excited about this Vital Essentials innovation and quickly purchased the raw bar for their store(s). 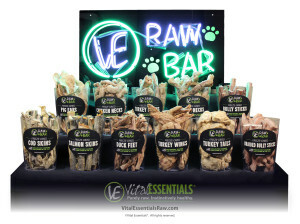 The raw bar includes an assortment of dehydrated pet treat/chews, along with a attention getting neon sign and accessory kit. Pricing is surprisingly reasonable, with Suggest Retail Prices on the 12 treats ranging from $.89 – $4.00. For stores, we recommend the Raw Bar. The product & merchandising is great, and it offers the price point & quality pet parents are seeking. We welcome your questions to determine if now is the time to add Raw Bar to your store. 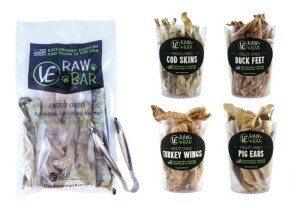 Vital Essentials has created a product like no other, a raw diet comprised of 100% meat, organ meat, and bone. They call it the ALPHA diet, and it’s designed to give your pet the quality of nutrition that only the biggest, strongest, healthiest member of a pack would receive in the wild. Vital Essentials Foods contain a minimum of 45% organ meats, providing an incredible wealth of nutrition for your pet.